Considering the shrubs and fruit - trees which belong to this Family, it may well take precedence of all others in importance. 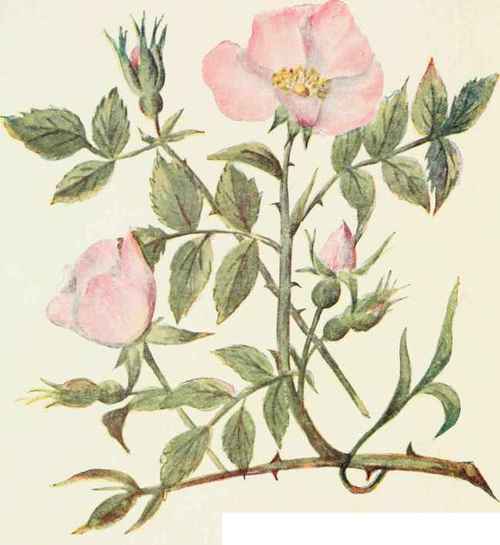 A rose hip, if cut open, will show the stamens all clinging to the inside of the hip, which is really the calyx tube. The petals and sepals are mostly in fives, but stamens and pistils are many. Underneath the sepals there are often green bracts which make the number of these organs seem twice as many. Our fruit-trees, apples, pears, cherries, plums, belong to this Family, and their blossoms, large and fragrant, are among the lavish gifts of spring. Shrubs like the hawthorn are numbered here, and the luscious strawberry, juicy blackberry, as well as the wild rose, with its dark-pink buds, make this Family second to none in fragrance, beauty, or usefulness. Pulse or Pea Family, to which our vegetables, the pea and bean, belong, is at once recognized by its papilionaceous corolla, so called from its fancied resemblance to a butterfly. The petals are so different they have received special names. The large, upper one, which infolds the others in bud, is the standard, generally broad, erect, or turned backward. The narrower, opposite, side-petals are wings. The lower one is considered to be two petals united, and, being hollowed and boat-shaped, is named the keel. The keel usually incloses the stamens and pistils. Stamens of these flowers number 10 (rarely 5), one being free, the other 9 mostly united by their filaments into a tube which is split open on the upper side. Through this split the pistil projects, later the pod or legume. The calyx is unequally 5-divided. To this Family belong not only the pea and bean, but cassia, liquorice, logwood, and other useful plants. None is poisonous. Many are ornamental climbers, with showy blossoms and graceful foliage. Their leaves are often compound, and the leaflets may be sensitive, folding when touched, also many of them "sleep" at night. The Pea Family contains herbs, shrubs, and trees. The Spurge Family contains the castor-oil and croton-oil plants; manihot, from which tapioca is made; and rubber-trees, the latter having come into great prominence in these days of automobiles and rubber tires. The stamens and pistils occur in different flowers, sometimes on the same plant, sometimes on different ones. Such flowers are called monoecious or dioecious. It is a very large Family in the tropics, but with us is known mostly in the genus Euphorbia. The manner of the flowering of this genus is singular. There is no proper calyx or corolla, but the flowers are surrounded by an involucre resembling a calyx divided into 4 or 5 lobes which are colored and cup-shaped. Between the lobes are thick glands. Within the involucre (once considered the true flower) numerous staminate flowers are borne, each consisting of a single stamen jointed on a tiny stalk (pedicel), very like a filament. A small bract accompanies each stamen. From the center of the cluster of stamens a single pistil is raised on a long stalk, the pistil consisting of a 3-celled ovary, 3 styles, and 6 stigmas. The plants contain a milky juice.